At a high of .8m/sec. historically, current drift rates in Nares St. look normal when no ice bridges are present or forming. So much for my prediction skills: only the largest remaining piece of A-Team's "E" got past Joe Island yesterday. It looks like "S" ran into Cape Baird causing "E" to rear-end "S", and the stress of the interaction broke "E" into pieces. The most recognizable (and 2nd largest) piece of “E” has a persistent dark mark on the image; it was on the rear port-side (east) part of “E” before the collision and remained (on Dec 4) in Hall Basin just off of Petermann Fjord and east of Joe Island. Today’s drama: Will this ‘marked piece of “E”’ get stuck behind Joe Island or will it be drawn back into the flow? Saturday: Will the ‘largest remaining piece of “E”’ get by Hans Island on Saturday? (It was obviously slowed down by the collision – yesterday’s prediction of a Friday arrival will not come to pass.) And how long will Espen’s “new large piece” keep its hexagon shape? Petermann Fjord is about 15 km wide, so pre-collision “E” was about 30 km long. It moved about 45 km between the Dec 2 and Dec 3 Sentinel-1 images – nearly 2 km/hr! The leading edge of the ‘largest remaining piece of “E”’ on Dec 4 was about 35 km downstream from where it was on Dec 3. The Dec 4 location is about 55 km upstream from Hans Island. I presume the Sentinel-1 images are spaced approximately 24 hours apart. indeed, it looks to me like word salad. Could spell trouble? Wonder what is coming up next! Thanks, Tor Bejnar. Do you think that's key to the 2007 'success' and record lows? PS: Per date (December 4th), 2006 (soon to be 07) has the lowest extent of all years this century. Viddaloo wrote: Do you think that's key to the 2007 'success' and record lows? Obviously it is a piece of the puzzle; a great deal more ice was exported through Nares Strait that winter, spring & early summer than in any other year (although small compared with Fram Strait export). I wonder if this Nares export somehow loosened up remaining ice in nearby parts of the Arctic allowing freer motion. There is also a lot of activity around the "Flade Isblink Corner" (North East Greenland). Thanks, according to your link Tor bejnar in december the average speed is around 12 km/day with a max of 40 km/day. So with 45 km/day with are in very high gear ! Espen’s “new large piece” lost it's top upon entering the strait. It is too long since the last animation. Here are the latest (Dec 9-16) images of ice entering the Strait. The last two frames suggest the first traditional arch is appearing. It will be interesting to see if the the current is strong enough and the Strait be emptied from old debris and new sea ice be formed? Nice stuff, gentlemen. Nares really is one of the coolest spots in the Arctic. Maybe not the most important, but definitely one of the coolest. Neven you right, Nares Strait is probably the most exciting site sea ice wise! Dubious shape for arch strength but does seem to be holding. Current transport below is still strong. DMI missed some data (they are available as Gigabyte downloads from ESA) but the latest image shows the arch holds, square shaped as it is. Looked a bit different on 24.Dec.13 and 23.Dec.12. Seems to me this is an arch with resistive strength only to the NW. One thing that is striking with these images is the remarkably fractured ice that is north of the arch. The floes appear to be quite small compared to 2012 and 2013. How much of the dark bits above the arch is surface melt? Not melt, but newly formed sea ice. So... Sea ice, near sea level, between the tall floes? Winds turned from north to south and now north again. It matters little to our arch. Downstream in the Kane basin a channel is visible through which the remaining ice floes move toward Baffin Bay. A curious white glitch in the north suddenly paints the darker thin ice between the thick floes pure white. Update from Berlin (the wifi is ok ), yes the formation of ice? South of Franklin Ø seems strange, and just in 24 hours? A curious white glitch in the north suddenly paints the darker thin ice between the thick floes pure white. I interpret that as more of a glint than a glitch. Sometimes a patch will light up like that in one image and then be back to normal in the next. See for example http://ocean.dmi.dk/arctic/images/MODIS/Kennedy/20141223s01a.ASAR.jpg where an image stitch seam cuts right across a similar glint south of Franklin. I'm still watching for another arch to form, farther down. I've only been watching the arctic ice since the sensational losses of 2012 but I've gotten the impression that Smith Sound is historically the typical place for an arch. The last couple of years we've seen arches more up into the Kane Basin but either way, most of the Nares is then immobilized for the winter. Our arch in the Lincoln this year looks precarious. It seems not that uncommon for the thick ice in the Lincoln to get squished around or see big cracking events. I can imagine either of these collapsing the arch and restarting export. Last week the arch survived as some cracks ran across the norther Lincoln Sea but didn't spread further south. This week I'm watching for the weather to maybe increase pressure on the ice and possibly squish it some. Meanwhile ice is flowing relatively freely down the length of the Nares. Somehow conditions need to change to slow the (now mostly young) ice enough to let another arch solidify. Arch holding despite the strong NE wind that blow through the Strait. Look at the entrance of the channel to the Peterman glacier: some ice floes that had parked there broke loose in the last frame. For previewing purposes ESA provides separate so called "quick-look" images that come with their giga-byte downloads. Where the data has dual polarizations, the quick-look images are false colored: Horizonatl for Red, Vertical for Green and and average for Blue, or at least so they say. 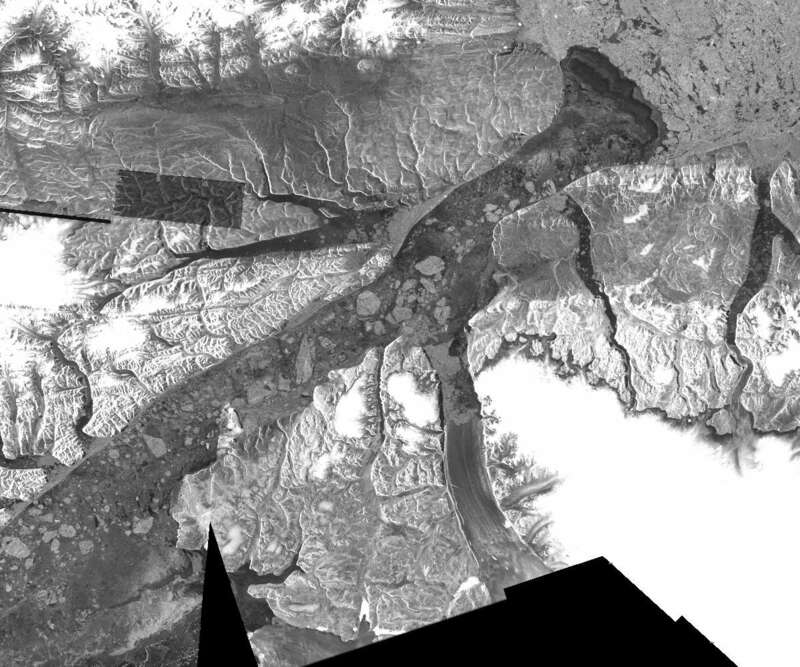 Some of these images are beautiful at their own, like this one showing Smith Sound between Kane Basin and Baffin Bay. The "fast" ice in the Kane basin (as elsewhere in the Nares Strait) seems to be under stress, an ice float broke off and several cracks are visible. One aspect of Nares Strait ice export I hadn't realized is associated with the lack of a second ice bridge. Right now there is an ice bridge only in the Lincoln Sea. The Sentinel images show sea ice forming just southwest of the bridge (at least, that is what I believe I am seeing! ), but without another ice bridge it is mostly carried southward by the flowing water. As long as a second ice bridge doesn't form, 'all' this new ice is getting exported. After some 'predictable' date when a second ice bridge forms and stops the ice from being exported, there won't be enough time left in the winter to grow the ice to '2 meters' thickness. The subsequent spring/summer thaw might start the ice export early. And the Kane Basin imaged today. The same cracks as in the previous image are visible. Most of the Nares Strait has been cleared from the "old" ice floes. The piece that broke away from the Peterman door step has made a surprising distance. Large pieces of the arch collapsing today. Pretty exciting. Thanks for all the images and animations, Wip and Esp. Starting to have more of the stable curvature of past years ... compressive no tensile, parabolic, transferring thrust to immobile rock on the sides. Wait and see where it ends up though. The Lincoln Sea is a bifurcation point where waters from the Canadian and Eurasian Basins flow to Nares or Fram Strait. Mechanisms that control which waters are found in the Lincoln Sea, and on its continental shelves, are unknown... Nares Strait is one of the two main passages through the CAA and year-round mooring data have estimated that the volume flux through Nares Strait ranges from 0.47 ± 0.05 million cu m per sec (Rabe in press) to 0.57 ± 0.09 (Münchow 2008), or roughly half of the total CAA transport (McGeehan 2012). Is it an artefact ? Petermann seems to be activated at the front ? I did not notice that there is a canal that link Petermann and the south where hot water may come diretly. Hasn't a low set up over northern Greenland in the last few days? Could this be causing the breakup of the arch? Most of the movement is occurring along the coast of Greenland as the ice moves southwest. Also, none of the ice that is now moving towards the strait appears substantial enough to block flow through the strait. I think all of this ice will be flushed through the strait. I really don't like what I am seeing with regards to ice thickness and transport through Nares and the Fram. Winds (down the Strait) are strong, yesterday 40-60 km/h, today 25-45 km/h. According to http://earth.nullschool.net. Several (3 in this case) quick-look images from different slices of the same orbit fit perfectly together for a panorama view. That is a great looking image Wipneus, where on the ESA site do find them, I can only locate images that are about 1 month old?